Dear Catalog CEOs: A Failure To "Be Online"
Here's a question that I'd like for you to answer with honesty. "Do you truly have an online channel?" More on the answer to the question in a moment. Online Pure-Plays (Excluding Amazon) experienced +18% e-commerce growth last year. The overall average growth rate for an online business was +14%. Catalog brands averaged -3% growth in the online channel. We failed to capitalize on our huge e-commerce head start. A decade ago, we had the infrastructure in place to fill orders efficiently, and we were ahead of the curve in the adoption of e-commerce and e-mail marketing. A half-decade ago, we were behind the curve in the adoption of search marketing. In many cases, we made up some ground via paid search ... of course, we had to "pay" to catch up. Today, we're waaaaaaayyyyy behind the curve when it comes to online marketing. See, we spent our time believing the multi-channel script provided by a vendor community with a vested interest in publishing a multi-channel script. We were told that all customers shopped because they received catalogs and then placed orders online. Today, we've lost a ton of market share. We focus solely on the customers who shop because they received catalogs. We failed to pay any attention to the 18-45 crowd, folks who shop very different than the baby boomer generation that took cataloging to a whole new level. We simply shut out the portion of the consumer audience that will generate business in the future. I get concerned anytime I hear a quote like "80% of our online audience matches back to a catalog" ... that is a symptom of failing to focus on the 18-45 crowd. Today, we view co-op marketing as a best practice. We give our most valuable asset, name & address, away to a co-op for free. We then pay the co-op money for access to other names. We then put expensive paper in the mail to an ever-shrinking audience of baby boomer customers who like to shop that way. Conversely, our online competition realizes that those same customers are available ... for free, online. Why didn't we pursue the "free" option? Modern e-commerce is rapidly moving in three different directions. Direction #1, From Retailers: Retailers have finally realized that if you're going to have a retail channel that is saddled with crippling debt, you may as well use that channel to facilitate a multi-channel experience. Through 2009, retailers used e-commerce and direct marketing as a way to drive store traffic. In the next five years, you will see retailers do the opposite --- they will use their stores to fuel e-commerce growth. You'll see mobile apps that a customer uses when she doesn't find the item she's looking for in the store --- she'll use her smartphone to simply place an e-commerce order with free shipping and two-day delivery. Ding! And the sale will be attributed back to the store via geo-targeting on the mobile app, helping Management leverage the crippling weight of debt acquired during the first decade of the century when the pundits said you have to leverage yourself to the limit in order to capitalize on bricks-'n-clicks. For retailers, direct marketing is moving away from the website and direct mail and e-mail ... it is moving to a combination of social media, social networks, and to mobile marketing via the smartphone. Direction #2, From Pure Plays: The online pure play will resemble a fusion of interactive television, social networking, and e-commerce. The concept of static websites and landing pages is long over. It is being replaced by the concept of an "entertainment network" ... think of your online brand as a media conglomerate that produces video programming, radio/podcast programming, written content, reality and lifestyle "shows", all deeply integrated with social networking, search, mobile, and e-commerce. It's a big festival of branding excellence! You'll interact with somebody on Facebook after watching your favorite "television show" produced by the pure play, ultimately purchasing merchandise on your smartphone via a social network that doesn't exist today but will have 100,000,000 users in 2013, purchasing merchandise that is delivered in two days with free shipping and free returns. The pure play can invest in this future, because it doesn't have 25% of net sales locked up in catalog marketing, and because it doesn't have the crippling debt of the bricks-'n-clicks retailer. Hint --- financial freedom will greatly benefit the online pure play. Direction #3, From Catalogers: Here's your chance to shape the future. This can go one of three different directions, really. We can be like Miles Kimball, who publicly stated that they are well-positioned for growth as the baby boomer generation ages into the Miles Kimball target demographic. That is a strategy that "could" work for another ten or fifteen years. Or we can decide to keep sending catalogs via the traditional catalog marketing model of the 1990s until there are a few hundred thousand people left who prefer that method of commerce. Or maybe, just maybe, there is something that can be learned from retailers and online pure plays, based on where they are heading, something that can be adjusted to fit the catalog model. Fortunately, we get to pick our future. One thing is certain, however. If we want folks under the age of 45 to purchase from us, we are going to have to "be online". This is different proposition than "having a website". As always, you may contact me with your questions and concerns. Welcome to the Gliebers Dresses Executive meeting. Fitz Gleason is in attendance. Glenn Glieber (Owner): "And so I think Ellen makes for a really good judge on American Idol. She adds a sense of humanity that is sometimes missing. Now, how many of you watched 'Lost' last week? Why is John Locke wearing a black t-shirt in some scenes, and then is dead in other scenes?" Fitz Gleason (Private Equity Mogul): "Can we get down to business, Mr. Glieber?" Glenn Glieber: "I'm just saying, it doesn't make any sense. All of these people appearing in different years. Do the kids get this, can they follow what is happening? Back in my day, if you wanted to be thoroughly confused by television, you watched McMillian and Wife, or McCloud, or both! You didn't crash planes into islands that shift based on different time dimensions, you rolled a station wagon off of a California cliff and you exploded it when it rolled to a stop at the bottom of a ravine. That's how we used to do it, back in the day. That's old-school." Kevin (via Skype): "Yes, it is me." Fitz Gleason: "Good, let's get this meeting started. I've got a plane to Switzerland that I have to catch." Glenn Glieber: "Folks, I want to make an announcement. This morning, I officially closed a transaction that transfers ownership of Gliebers Dresses to Gleason Investments." Roger Morgan (Chief Operations Officer): "How much did you get, Glenn?" Pepper Morgan (Chief Marketing Officer): "Roger?????" Glenn Glieber: "That's ok, Pepper, I'm happy to share the details with you, because all of you are part of this transaction. I sold the business to Gleason Investments for $12,000,000. Gleason Investments assumes $3,000,000 of personal debt, and paying the remaining $9,000,000 in cash. As a condition of the sale, Gleason Investments agrees to retain each member of the Executive team for a period of twelve months. Each Executive team member that stays on for the full twelve month period will receive a check for $500,000, payable April 1, 2011." Fitz Gleason: "That's not how we normally do business, Roger, but Glenn convinced us that all of you have had to make due without an incremental investment in resources to run this business over the past few years. He wants to see how you perform when you are given the resources you need to run the business in an effective manner. In some ways, I want to see that, too. And you should know this fact. Glenn took a multi-million dollar haircut in order to make this arrangement work. We were prepared to offer Mr. Glieber $14,000,000, but he wanted to make sure you were taken care of." Lois Gladstone (Chief Financial Officer): "Mr. Gleason, who will be the new CEO of Gliebers Dresses?" Fitz Gleason: "I am happy to announce that Brendan Templeton will be the new CEO of Gliebers Dresses." Meredith Thompson: "You mean the Brendan Templeton who built Zeldies into an unprofitable billion dollar online handbag business that you acquired last year? The 29 year old whiz-kid that was on 60 Minutes for his unorthodox customer service strategies?" Fitz Gleason: "The one and only." Roger Morgan: "He'll be 30 by the time he takes over here." Lois Gladstone: "What does he know about running a profitable catalog business?" Fitz Gleason: "He might ask the same question of you, Lois. Let my team squeeze the profit out of this business. Let Brendan work on growing Gliebers Dresses. I want to see this unprofitable $45,000,000 business become a $100,000,000 industry success story that prints $10,000,000 of annual EBITDA by the end of 2013. I want a fast return on investment, folks." Pepper Morgan (Chief Marketing Officer): "Wow." Roger Morgan: "Is that even possible?" Fitz Gleason: "Oh, it is possible. I want to see Gliebers Dresses become a revered retailer." Lois Gladstone: "You mean one with stores?" Fitz Gleason: "I mean we'll use any and all resources available to restore your brand to prominence. If we want to open stores, we'll open stores. If we want for Gliebers Dresses to be the dominant mobile marketer of the 21st century, we will make that happen. If we want a commercial on the Super Bowl, we'll invest $2.9 million dollars to do that." Pepper Morgan: "It sounds like the days of free marketing are over." Glenn Glieber: "I loved free marketing!" Roger Morgan: "Man, $100,000,000. It would have taken us a long time to get there, even now with Pepper's new catalog strategy being 4% better than what we did last year." Lois Gladstone: "Do you know what it takes to scale a business from $45,000,000 to $100,000,000 a year?" Fitz Gleason: "Absolutely. We've done it before, and we'll do it again. I will say this. It doesn't take 'business as usual'. It takes a whole new set of eyes. I'm confident that Brendan Templeton will provide a whole new set of eyes for each of you." Meredith Thompson: "Are we going to remain a dress brand?" Fitz Gleason: "It shouldn't be a surprise that Brendan knows how to grow an Accessories business. A modern multi-channel brand knows how to leverage multiple channels, and multiple merchandise divisions. I'd say that no good idea is off the table. And with that, I need to catch a plane to Switzerland. We'll be in touch soon, teammates! And Kevin will be sticking around during the transition. He's going to closely analyze and monitor customer behavior, so that we can see if our strategies are working or not. You should know that his Marketing Simulation showed that the business had enough potential to warrant this sale. Now we'll get to see if his predictions of the future come true, or not. Ok folks, we'll be in touch." Meredith Thompson: "Glenn, when is your last day?" Glenn Glieber: "My last day is March 31. Brendan begins his job as CEO on April 1." Meredith Thompson: "Are you going to be around for questions or help, should the business need you?" Glenn Glieber: "No, I am done. This business belongs to Fitz now. I just bought a forty foot diesel RV, completely decked out, king-sized bed, satellite television, you name it! My wife and I are going to take a couple of years and travel the country. Environmental advocates will hate me and the seven miles per gallon I'll get as I blast my way across America." Pepper Morgan: "You don't look good, Glenn. You look pale and sound tired. Have you lost weight?" Glenn Gleiber: "I've lost about twenty pounds in the last three months. Maybe the stress of all of this is killing me." Meredith Thompson: "I'm going to miss you, Glenn." Glenn Glieber: "And I'm going to miss all of you. But, honestly, I've earned a break. Gliebers Dresses was my life. Now, I need to make an exit. It is time for somebody with passion to take this business to places I couldn't take it." Roger Morgan: "When do the employees get to hear about the changes?" Glenn Glieber: "I will say my goodbye to all employees on March 31, the day before the transaction closes. We'll have a big party that night!" Meredith Thompson: "This will be the worst kept secret of all time." Any analysis of Digital Profiles should include a distribution of new customers by Digital Profile. 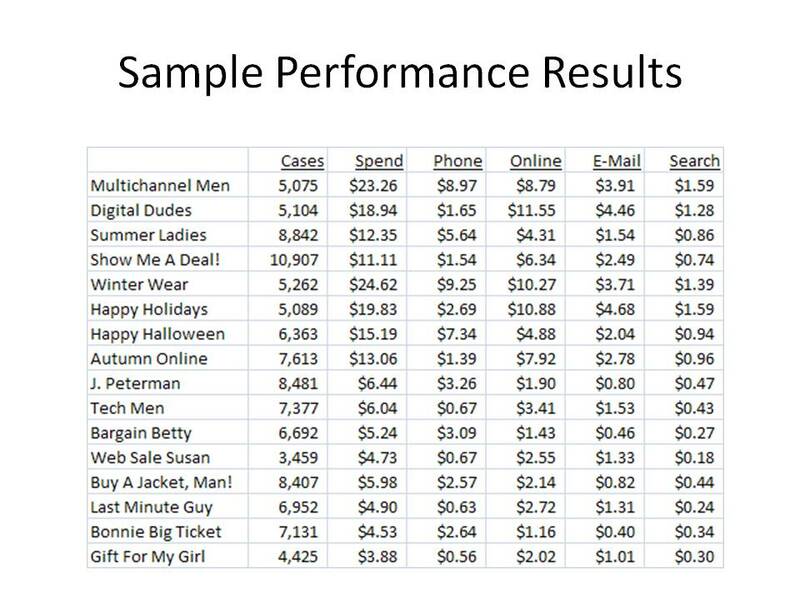 Remember, our best customers were Multichannel Men, Digital Dudes, Winter Wear, and Happy Holidays. Now take a look at the Digital Profiles that are capturing the most new customers. In other words, this business is clearly in transition. The high-value Digital Profiles are not growing, while a different set of Digital Profiles, those that possess infrequent buyers, are taking over. Now, granted, this is part of what online marketing or catalog marketing is all about --- you don't acquire the best customers, you acquire customers with some migrating to "best" status. Still, as a business leader, you want to know where your business is headed. Digital Profiles explain these trends in a way that lay people can understand. 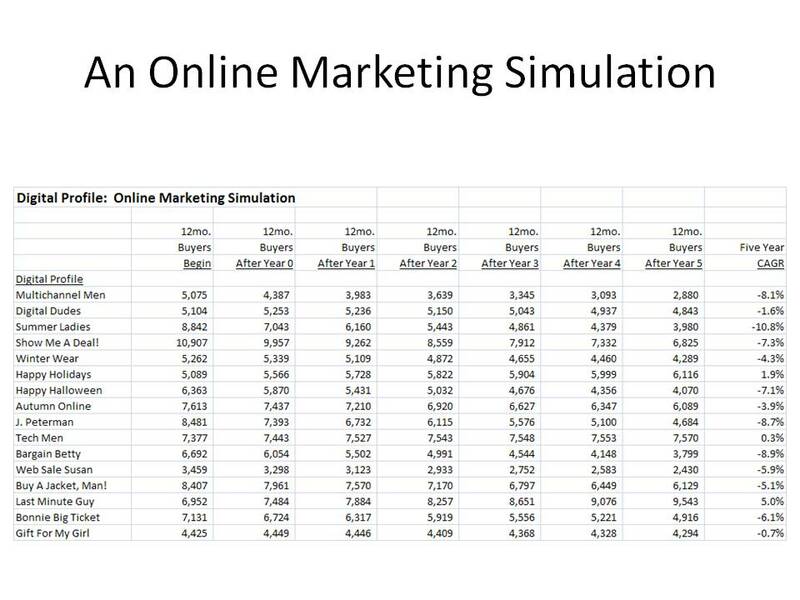 I really enjoy using Digital Profiles in my Online Marketing Simulation algorithm! Here's a five year simulation, illustrating customer counts by Digital Profile. Remember, there are a handful of Digital Profiles that exhibit high performance, including Multichannel Men, Digital Dudes, Winter Wear, and Happy Holidays. When we run all of our Digital Profiles through the simulation, we see trends that, in this case, are not necessarily favorable. Multichannel Men are projected to decline from 5,075 to 2,880 over time. Digital Dudes are hanging in there, from 5,104 to 4,843. Winter Wear show a significant drop, from 5,262 to 4,289. Happy Holidays, however, are on the increase, from 5,089 to 6,116. Clearly, there is a trend away from Multichannel Men, and a growth area among the Happy Holidays segment. But overall, the best segments are losing customers, and that is never a good thing. Which segments are increasing over time? You see a trend away from good customers, and you see increases in online Digital Profiles and Digital Profiles that represent customers shopping for a need during the Holiday Season. In other words, Digital Profiles provide a way for the business leader to understand the psychographic trends that underlie the business. Sometimes, folks view the work I do as being "theoretical" or "professorial" ... there isn't a direct connection between what I'm talking about and helping your business grow in an actionable way. So let's take a step back, and review simple concepts that can immediately grow your business, starting tomorrow. For the past three years, I've analyzed close to fifty different direct marketing businesses. You send me your customer data, sometimes going back ten to fifteen years, and I then analyze how your customers are migrating across channels. I analyze how "loyal" your customers are, measured by a metric called "Annual Retention Rate". 39% of the customers who purchased in 2009 will purchase again in 2010 --- this is called the "Annual Retention Rate", and is the most important loyalty-based metric you can calculate. 18% of the customers who last purchased 13-24 months ago will purchase next year. 9% of the customers who last purchased 25-36 months ago will purchase next year. What does this mean? Well, it means that, on average, we don't retain our customers. Our customers are not loyal to us. Here's an example. Assume you have 10,000 customers who last purchased in 2009, 6,100 customers who last purchased in 2008, and 5,000 customers who last purchased in 2007. How many customers will purchase in 2010? 2010 Buyers = 10,000 * (0.39) + 6,100 * (0.18) + 5,000 * (0.09) = 5,448 Buyers. Now, in order to maintain the quantity of 10,000 buyers that you had last year, you need 4,552 new customers. At this point, the blogosphere and the Twitterati, people who in most cases haven't had the benefit of running a business, will tell you that it costs eight times more to acquire a new customer than to keep an existing customer. They'll ask you to do things that improve customer loyalty. Much of the advice, of course, is based on personal preference and opinion. If there were easy ways to increase customer loyalty, everybody would be doing it and loyalty would dramatically improve and the economy wouldn't be a mess, right? But let's assume that you magically find a way to increase customer loyalty by 15%, across the board. Now how many buyers do you need to acquire in 2010? 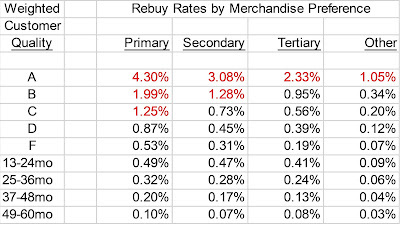 2010 Buyers = 10,000 * (0.39 * 1.15) + 6,100 * (0.18 * 1.15) + 5,000 * (0.09 * 1.15) = 6,265 Buyers. So that's a good thing ... assuming, of course, that you know of some magical set of tactics that nobody else discovered yet, tactics that allow you to immediately improve customer loyalty by 15%. If you have that magical formula, then you only need 3,135 new customers to keep your customer file flat. And if you have the magical formula for customer loyalty, then you won't be content with keeping your customer file flat to last year, will you? Of course not! You'll want to grow by 10% or 20% or 30%. And in order to do that, what do you need? More new customers! So you'll continue to try to acquire at least 4,600 new buyers, won't you? Focus a disproportionate amount of time and energy on finding new customers. It's that simple, it is completely actionable, and it is largely within your control. Every one of your marketing staff members should be tracking new customer counts. Don't pay an annual bonus to your marketing team unless your marketing team increases the number of new customers within lifetime value constraints. For many, customer acquisition opportunities have been maximized in offline channel. Your co-op isn't going to develop a model that increases customer acquisition counts by 30%. And there isn't a magically productive list out there just waiting to be rented. The obvious answer, then, is to find ways to acquire new customers in your online channel. This doesn't always mean that you have to pay/advertise to acquire new customers. A simple 5% improvement in conversion rate could do the trick, assuming that you have projects on your book of work that would solve your conversion rate problems. Think of all of the traffic that you drive with offline/catalog marketing, traffic that doesn't convert. Is that the fault of your catalog marketing activities, or is that the fault of your website? And if it is the fault of your website, then why is 75% of the time often spent improving catalog marketing performance? Acquiring new customers is the single most important thing a marketing department can do to improve business performance. If you want something actionable to take back to your marketing team, make the majority of their annual bonus payment dependent on acquiring significantly more new customers within lifetime value constraints, and force them to improve customer acquisition performance via the online channel. Then give them the resources to accomplish the mission. I'm confident you'll see an uptick in business performance! The Gliebers Dresses Management Team invited Kevin to lunch to discuss the latest developments at Gliebers Dresses. Roger Morgan (Chief Operations Officer): "Kevin, are you enjoying your BLT?" Roger Morgan: "Good. Now tell us what the heck is going on?" Pepper Morgan (Chief Marketing Officer): "Did I hear Mr. Gleason suggest that we're all going to be fired?" Lois Gladstone (Chief Financial Officer): "Wouldn't that be just plain silly? I mean, as of this morning, Pepper's catalog strategy is +9% for the year, we're fixing this business." Meredith Thompson (Chief Merchandising Officer): "Kevin, did Glenn give you any indication that this was coming?" Kevin: "My conversations with Mr. Glieber are confidential, just like this discussion will be confidential." Roger Morgan: "It's like Glenn threw all of us under the bus." Pepper Morgan: "Is this about us, or is this really a function of the fact that this business is failing and Mr. Glieber wants to retire?" Meredith Thompson: "Do you think we'll get a severance check if we're fired? I mean, how the heck would I feed my family?" Roger Morgan: "Oh, I'm sure we wouldn't be out of a job for long, would we? I mean, there are tons of companies that are dying to hire people with our level of experience. We'd get jobs quickly!" Lois Gladstone: "I heard that there are six job applicants for every available job right now. That's not very encouraging." Kevin: "When is the last time all of you had lunch together, on your own, without Glenn arranging it?" Pepper Morgan: "I think this has to be the first time that has ever happened." Meredith Thompson: "It's almost like the possible sale of the company brought us closer together." Kevin: "People don't talk about this often, but successful companies often have really good chemistry between business leaders. That doesn't mean there isn't conflict, but the leaders have a good relationship with each other." Roger Morgan: "Kevin, what could we have done to fix this business? Didn't we do everything in our power to prevent this from happening? Isn't this just a consequence of a lousy economy and a shift in customer preferences away from catalogs?" Kevin: "Let me ask a question. What would all of you do if you were running a newspaper? I mean, they are being clobbered by a shift from analog to digital." Roger Morgan: "Boy, I'd be all over testing every possible strategy to grow newspaper readership online. I'd try pay walls, I'd try pay-per-article strategies, I'd try various free models paid for by advertising, and I'd probably start spin-off brands that are not tied to the legacy of the original newspaper brand." Meredith Thompson: "And we did a lot of that. We tried a social media presence. It was a disaster. We could create a mobile marketing strategy, but our 60 year old customer isn't out there be-bopping with iPhone apps. A Mobile strategy couldn't work for us, heck, a lot of our customers are so rural that they don't even have cell phone coverage! So what the heck should we have done?" Pepper Morgan: "Maybe we aren't the right people to help a business through such a significant transition." Roger Morgan: "Of course we're the right people. And what we were doing was appropriate. Pepper, your new catalog strategy is, year-to-date, 9% above last year. Glenn didn't give us the time we needed to get us through the transition. He seems stressed, like he wants to cash out. Where the heck does that leave us?" Meredith Thompson: "What the heck would new owners do with our merchandise? I just cringe at the thought of working with another company, one where we have to source our merchandise with a sister brand in order to fulfill some mythical operational efficiency that looks good on a p&l but is hated by the customer. That's my fear." Pepper Morgan: "What would we do with Sonora? She needs a quality private school experience in order to blossom into the young woman I think she can be. I can't send her back in to the public school system. I can't. I won't. I mean some of those schools have 25 or 30 kids per classroom. Sonora deserves better." Roger Morgan: "Did you hear how that guy addressed me? It was like he was taking direct pot-shots at me, as if I am the reason this business is failing. I almost got the impression that he didn't want me to be part of the future of this business. Isn't that crazy? I mean, I read a Neptune Research report that says that incumbent companies are always ousted by new technologies. That's not my fault, that's just life. Catalogers had it good for a hundred years, now, technology is disrupting our business model. It's just simple Darwinism, isn't it? Sure it is. It isn't my fault." Pepper Morgan: "Marketing would be folded in to the corporate borg. Finance would be folded in to the corporate borg. Operations would be folded in to the corporate borg. What's left?" Lois Gladstone: "The borg. That's all that is left." Meredith Thompson: "I sure hope this doesn't happen. I just hope Glenn comes to his senses, and decides to believe in us." Kevin: "What if Glenn doesn't have the money to continue to fund losses?" Lois Gladstone: "Oh, that's crazy." Roger Morgan: "I think I'm gonna get on LinkedIn and start networking. Maybe I can cash in on all of those relationships I've built over the years. Kevin: "Really. How many of you have prepared yourselves for a day like this by maintaining a base of contacts, by providing help to others for the past several years so that when you needed help, you had an army of people waiting to assist you?" Lois Gladstone: "Who has time for that? If I lose my job, I'll just send out an e-mail to my contact list, and I'll attach my resume. I'll have a new job in less than thirty days." Kevin: "This is a challenge, isn't it? You have to prepare for an uncertain future while still working sixty hours a week. How do you balance the time? Do you have resources to even do it? And yet, a day comes when circumstances force you into the future. Either you are prepared, or you aren't prepared. It's that way with our careers, and it is that way when technology supersedes our business model. In either case, we have to invest a lot of time that appears to have little ROI, so that we're ready when circumstances conspire against us." Meredith Thompson: "Yeah, I was at the SocialMerch conference in Atlanta, and they talked all about how you have to spend an hour or two a day developing your own personal brand, so that when something bad happens, you have your own personal brand to fall back on." Roger Morgan: "Did you folks hear about Mack Collette at Woodside Research? He reported on Social Media for them, built a list of 27,000 Twitter followers, wrote a bunch of profitable research reports, and then left the company to start his own Social Media Research brand. Now Woodside Research won't let any employees write their own blogs, a strategy that is opposite of everything they've been telling all of their clients to do. So maybe a personal brand is important in this day and age." Lois Gladstone: "E-mail with a resume attached, folks. E-mail with a resume attached." Ok, you've come up with sixteen Digital Profiles. Now you need to name them. This might be the hardest part. The names should be catchy, and should directionally describe what the customers in that Digital Profile have done, or are likely to do. Digital Dudes (Men who love to shop online). Summer Ladies (Women who purchase merchandise in May/June/July). Show Me A Deal! (Women who buy lots of merchandise on sale). Winter Wear (Customers who buy in the winter). Happy Holidays (Customers who limit shopping to the Holiday Season). Autumn Online (Women who prefer the Fall assortment, in September or October). J. Peterman (A male shopper with taste and attention to detail). Tech Men (Think of a male shopper in the Bay Area, one who hates seeing trees cut down and converted into advertising catalogs). Bargain Betty (A rural female shopper who buys inexpensive items and sale items). Web Sale Susan (A suburban female shopper looking for the best deal online). Buy A Jacket, Man! (A male shopper who only looks for outerwear). Last Minute Guy (A male shopper purchasing gifts with expedited shipping). Bonnie Big Ticket (A female shopper with a discerning taste for expensive items). Gift For My Girl (A mom shopping for her daughter). You simply analyze all of the variables that comprise each Digital Persona, looking for trends that illustrate what this customer is all about. Up Next: A sample analysis or two! Do you remember when you made the decision to sell via the internet? You waited a few years, watching companies like Amazon stumble and bumble and then grow at an epic rate. At some point, you realized that this "internet thing" wasn't going to go away, and maybe you could even garner a few incremental dollars of sales by having a website. Do you remember when a few folks told you they were using this goofy service called "Google"? They would search for something, and this tool actually returned relevant results. They found that they didn't have to remember anything anymore, that "Google" remembered everything for them. And they found all of these little online brands that seemed to own the first ten results on "Google", little online brands that offered free shipping and cheaper prices for the same merchandise you sold. You decided that it was time to start a paid search program. In the case of search, catalog brands were probably a bit behind the times. Do you remember when folks told you that you had to participate in Social Media? All of these Social Media experts sprung up out of nowhere, some of them with audiences of a hundred thousand or more. They told you that if you set up a blog, or got on Facebook or Twitter, you'd have real conversations with real customers, and you'd make a fortune. Remember that? You heard all about Zappos and their army of bloggers and watched them consume footwear. So you tried Social Media, mostly because it didn't cost much, but the effort was tepid. Eighteen months later, your blog has ten page views a month and you have 294 people that will only follow you on Twitter if you offer 25% off and free shipping. Sometimes, the strategies that the futurist pundits tell you that you must do work (internet). Sometimes the strategies work, but they do not scale all that well (search). Sometimes, the futurist pundits miss their mark by a bit (social media). This brings us to mobile marketing, aka "The Next Big Thing". At Webtrends Engage, we learned that 11% of all page views at The Huffington Post are on mobile devices. Mobile, however, can go in any direction. It can become a tool used to facilitate social relationships. It can become an extension of search. It can become the future of computing. And it can go in directions we cannot imagine today (most likely). This is one of those inflection points in direct marketing history. We were ahead of the curve when it came to the internet. We were way behind the curve as the internet morphed into a social monster. This time, we can create the future. Why not test now, while the costs are relatively cheap and the risks are exceptionally low? This is a transcript of an interview with Meredith Thompson, Chief Marketing Officer at Gliebers Dresses. Meredith Thompson (Chief Merchandising Officer): Kevin, let me ask you a question." Meredith Thompson: "How do I fit into the internet era?" Meredith Thompson: "Assume we're purchased by a private equity firm, and all of us lose our jobs, as we think is likely to happen. How do I get a job with an internet company?" Kevin: "Why do you have to get a job with an internet company?" Meredith Thompson: "It seems like catalog companies are struggling. If I want to have a future, I have to work at an internet company. And I don't think I'm qualified to do that." Kevin: "Why do you think you aren't qualified to work at an internet company?" Meredith Thompson: "Earlier this week, I attended the SocialMerch conference in Atlanta. It's the premiere merchandising analysis conference for the online merchandising community. I was absolutely lost." Meredith Thompson: "Let me give you an example. I attended a session called 'Maximizing Merchandising Conversion Rates'. The speaker said that if less than 10% of your website visitors want to purchase your merchandise, then you are a huge failure. And everybody took notes, and they had a big screen with all kinds of comments from folks on Twitter, and they all agreed with the speaker." Kevin: "Is it possible that everybody was wrong?" Meredith Thompson: "I doubt it. I mean everybody agreed with the speaker. And our conversion rate at Gliebers Dresses is a lot less than 10%." Kevin: "Might I suggest that your speaker hasn't worked with a thousand different companies, so s/he doesn't know what an acceptable conversion rate should be? And is it possible that all of the comments on Twitter were from people who also haven't worked with a thousand different companies and don't truly know what the right answer is?" Meredith Thompson: "Yeah, sure, I guess. The speaker said you have to maximize conversion on non-branded keywords. The speakers said you have to maximize conversion on branded keywords. The speaker said you have to have a mobile marketing strategy. The speaker said you have to offer cross-sell and up-sell opportunities. The speaker said you have to use banner advertising remarketing programs. The speaker said you have to be completely integrated with the social media community in order to survive. The speaker said you have to have deep relationships with customers via mobile marketing, or you'll be finished. The speaker said you have to have big orange call-to-action buttons or conversion rates will decline by 8%." Kevin: "What did the speaker say about finding great merchandise?" Meredith Thompson: "Well ... nothing." Kevin: "Think about the words of the speaker. Not once, according to your comments, did the speaker suggest that a customer purchases something because of the merchandise you have to offer. The reality is that is the ONLY reason the customer purchases from you ... because you have merchandise that meets or exceeds a customer need. Now, there's a lot of truth in what the speaker is saying. But if you don't have great merchandise, none of that other stuff matters. And guess what your job is?" Meredith Thompson: "No, but the speaker kept talking about satisfying the needs of the MODERN customer. The speaker mentioned how important it is to maximize conversion rate. I have no idea how to do that. Does the modern customer even care about merchandise?" Kevin: "It sounds like the speaker specializes in social and mobile and website conversion. So those are the things that the speaker is an expert in. Again, you are a merchant. You have to be an expert at getting great merchandise, right?" Kevin: "Did the speaker ever work as a Director or Vice President at a non-vendor-based company?" Meredith Thompson: "Well, no. The speaker has been with an online marketing firm since 2002. But the speaker has a really popular Twitter presence." Meredith Thompson: "The speaker said that almost all pieces of direct mail are thrown out, that direct mail is dead. The speaker quoted a statistic from Woodside Research suggesting that the Post Office will be bankrupt in 2019." Kevin: "You'll be retired in 2019, assuming that Woodside Research is so smart that they can accurately predict things that will happen nine years from now. And if Woodside Research is that smart, then they should have been able to predict the economic collapse. Go find a white paper that shows that Woodside Research was so prescient that they were able to identify when the Great Recession was coming and then warned every one of their clients about impending doom and then protected every one of their clients from the collapse of our economy. Until you find that document, listen to their predictions with a grain of salt." Meredith Thompson: "But until then, I may have to find a job. How do I compete against these 30 year olds who know how modern customers behave? I mean, these people have all of these statistics to prove how customers perform. I don't have any statistics to counter them. They claim to know how to make a campaign spread virally. I try to avoid anything viral, I don't want to get sick!" Kevin: "You are assuming that these 30 year olds know exactly how customers behave. What they truly know is how customers "click". They don't know why customers do anything. YOU know WHAT customers buy. That gives you a significant advantage over every single 30 year old preaching to you about how you have to market to modern customers. Anybody can become an expert at analyzing clicks, there's free software to allow you to become an expert. Almost nobody has the instinct to know what merchandise a customer will want to buy nine months before the season begins, knows how to source the merchandise, and knows how to present it to the audience in a way that causes her to buy something that she never even knew she wanted to buy." Meredith Thompson: "Still, this whole internet thing feels really uncomfortable." Kevin: "Play to your strengths. Every time a 30 year old internet whiz with five years of social media experience blasts you for not pursuing a valid social media or mobile strategy, ask the 30 year old internet whiz to predict for you what merchandise is most likely to sell nine months from now. Stand up for yourself!" Meredith Thompson: "Ok Kevin, thanks for the encouragement." This brief Marketing Sherpa case study describes the outcome of a Multichannel Forensics project at Paul Fredrick from last year. Hint: You can mail fewer catalogs and be more profitable! Marketing Sherpa Article: Fewer Catalogs, Same Results: 6 Lessons for Saving Big on Mailing Costs. Click here to contact me for help with your Multichannel Forensics project! You are listening to a special Gliebers Dresses Executive meeting, where Mr. Glieber is set to make an announcement. Glenn Glieber (Owner): "Folks, I gathered you together this morning to make an announcement. Thank you all for joining me at this early hour." Kevin: "Yes, it is me." Glenn Glieber: "Folks, I want to introduce you to Fitz Gleason. Fitz is a Principal at Gleason Investments, a Private Equity firm that specializes in the acquisition of Catalog brands. I asked Mr. Gleason to consider the acquisition of Gliebers Dresses. Mr. Gleason believes that Gliebers Dresses may be a good fit within his portfolio of Catalog brands, and would like to explore the opportunity to acquire our brand." Meredith Thompson: "You are selling Gliebers Dresses to a Private Equity firm? Isn't that what people do when a company is distressed? We're not distressed, are we?" Fitz Gleason (Principal, Gleason Investments): "First of all, I would like to thank all of you for the opportunity to consider acquisition of your fine brand." Lois Gladstone (Chief Financial Officer): "Wait a minute, just wait a minute. No disrespect, Mr. Gleason, but we've largely fixed this business, Glenn. 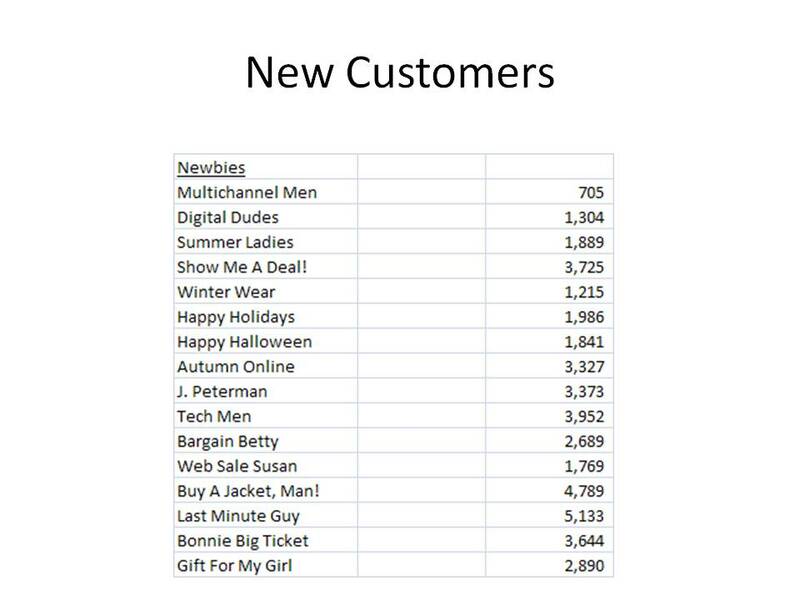 Pepper's new catalog strategy is trending +11% to last year. Our loyalty program has the potential to catapult us into new levels of sales opportunity. Sure, we've lost money for several years in a row. That doesn't mean we're distressed, however." Fitz Gleason: "Team, I don't think we're focusing on Gliebers Dresses as a distressed company. Gleason Investments has a long and proud history of helping Catalog brands achieve improved performance through operational streamlining, backend efficiency, merchandise analysis and strategy, marketing excellence, financial prudence, and overall brand alignment." Roger Morgan (Chief Operations Officer): "Let me understand your role, Mr. Gleason. Woodside Research recently released a report suggesting that Private Equity firms would aggressively pursue purchase of distressed Catalog brands in 2010, in order to extract value from brands struggling to meet the needs of a modern customer. Are you suggesting that Gliebers Dresses struggles to meet the needs of a modern customer?" Fitz Gleason: "Mr. Morgan, I haven't even had an opportunity to properly introduce myself yet, much less address a comment from an obscure report from a research organization looking to profit off of theoretical predictions that may or may not come true." Pepper Morgan (Chief Marketing Officer): "Why don't we give Mr. Gleason the opportunity to share his views with us first, before judging his intentions?" (Pepper glares across the table at Roger. Roger simply shrugs, in response to Pepper's glare. At the same time, Lois is busy rubbing her right hand across her thigh in a tense, back and forth motion. Meredith's right foot can be seen tapping the floor). Fitz Gleason: "Thank you Ms. Morgan. Look, I am strongly considering purchase of your business. During the next few weeks, I will spend time with each and every one of you. 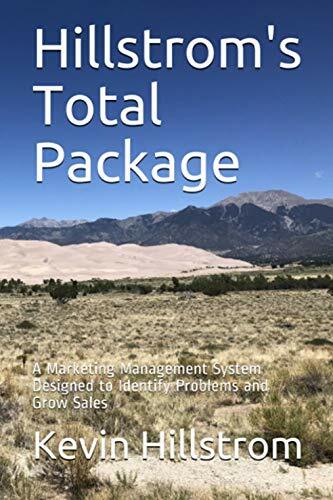 I want to thoroughly understand how you manage business today, so that I can determine an appropriate purchase price, so that I can properly assess how the management of this business will be addressed going forward." Roger Morgan: "I can't believe you are doing this to us, Glenn." Meredith Thompson: "Frankly, I'm in shock. I wish I'd have known about this before sitting down here today. Anyway, Mr. Gleason, can you describe some of the things your organization does in order to improve business performance?" Fitz Gleason: "Certainly Ms. Thompson. Let's look at Marketing. I tend to combine customer databases across my brands, for the purposes of cheap customer acquisition. Why pay a co-op six cents or twelve cents or twenty-four cents per name when you can walk up to the Gleason Investments trough and pay nothing for access to names from our family of Catalog brands? Our statisticians can mine the data in a way that allows you to find the best prospects for your business. That's money that simply drops to the bottom line." Roger Morgan: "You would combine our customer database with other companies? Oh boy. Neptune Research issued a research report that suggests customer privacy is violated when database information is combined across brands. And when customer privacy is violated, customer trust is eroded. And when you erode customer trust, you lose loyalty. Frankly, that doesn't sound like a good outcome ... reduced loyalty in exchange for saving a few pennies here and there." Fitz Gleason: "Mr. Morgan, thank you for your concern. Let me make something clear. In my world, we don't reference research reports. We either stand by our own personal convictions, or we get out of the way. Another thing we do at Gleason Investments is to focus on departmental accountability. In other words, the Operations Executive cannot cross the firewall between Operations and Marketing. It is the job of the Operations Executive to excel at Operations. And when that isn't possible, I combine Operations functions across sister brands in order to better leverage the profit and loss statement. This may mean that the Operations function is absorbed by corporate Operations at Gleason Investments. You and I will spend considerable time together, judging whether this is the best way to proceed, should I decide to purchase Gliebers Dresses." Lois Gladstone: "I assume, Mr. Morgan, that you have a strong partnership with Finance, and that you require a strong Finance function that sits outside of the corporate org-chart, correct?" Fitz Gleason: "Yes, Ms. Gladstone, I require a strong partnership with Finance. In many cases, the partnership is best served by having Gleason Investments absorb all Finance responsibilities into the corporate Finance function. Often, we can deliver the best return on investment to Gleason Investment shareholders by streamlining corporate functions into one corporate structure. We can leverage corporate finance to do much of the work done by existing Finance teams, allowing profit to simply drop to the bottom line." Lois Gladstone: "Yeah, but, ... but where would my team drop to?" Fitz Gleason: "I assure you, Lois, a thorough review of every job function is part of the purchase process. When we find value, we extract it. When we find efficiencies, we exploit them. Look, this isn't personal, it's business. Your business is not generating profit. My business is all about generating profit. We're simply going to make decisions that are in the best interest of the brand." Lois Gladstone: "It's personal to me. That's the same kind of crap that Tom Hanks said to Meg Ryan in 'You've Got Mail' as he was in the process of running her out of business." Meredith Thompson: "It sounds like you are focusing on carving up our Executive team, and then assigning the backend functions into corporate departments at Gleason Investments." Fitz Gleason: "If I decide to purchase this business, it will be my first priority to make sure that I extract the best return on investment humanly possible from this business. This may mean that I have to strongly consider streamlining backend operations in order to better leverage the profit and loss statement. We have to face the modern realities of Catalog marketing. Costs have escalated, but in spite of all of the multichannel chatter out there, response hasn't improved in a decade. Eventually, you have to make touch choices. You either raise prices while holding cost of goods flat, or you hold prices flat while reducing cost of goods sold, or you reduce marketing expense, or you attack the corporate expense structure. Those are your choices, Margaret. I'm looking forward to seeing your action plan for either raising prices while holding cost of goods flat, or for holding prices flat while reducing cost of goods sold." Meredith Thompson: "My name is Meredith." Roger Morgan: "You can't even get Meredith's name right? Come on!" Meredith Thompson: "What is your Merchandising strategy, Mr. Gleason?" Fitz Gleason: "Again, I will leverage all possible internal resources at Gleason Investments, in order to deliver the best possible return on investment for Gleason Investment shareholders. That being said, without merchandise, there is no reason for Gliebers Dresses to exist. So I demand absolute ruthless analysis of every single sku at every company I manage. There must be a concrete reason for a sku to exist. Each sku must cover research and development costs, inventory costs, operational costs, marketing costs, liquidation costs. I'm certain that, as a team, you already have a process for ruthlessly analyzing every single sku across every single channel, right?" Roger Morgan: "Do we, as an Executive team, have the time to analyze every single sku? That's the definition of micro-management, right? And, besides, you told me not to step out of my silo to offer opinions, so I'd never micro-manage Meredith's business." Fitz Gleason: "Mr. Morgan. Can you tell me the percentage of distribution center expenses allocated to the worst selling third of skus? In other words, tell me if 52% of your expenses are required to maintain the worst selling third of skus, or if the percentage is 82%, or 33%. Can you give me that percentage, Mr. Morgan?" Roger Morgan: "At Gliebers Dresses, we have a long history of operational excellence. We've developed proprietary methods that accurately outline all relevant expenses associated with managing a distribution center." Fitz Gleason: "Mr. Morgan, if I elect to buy your business, I will personally sit down with you to review every single proprietary method or metric you've developed. I will also share the set of metrics that my business leaders use to accurately measure distribution center excellence. Following our discussion, we will arrive at a set of metrics that best illustrate your performance, benchmarked against competing brands." Meredith Thompson: "This doesn't sound like it will be a very pleasant experience, Roger!" Fitz Gleason: "I think it can be a pleasant experience, Ms. Thompson, if you view this as a learning opportunity, as an opportunity to go from being unprofitable to being profitable. If you want to continue to do things the way you've always done them and are willing to use your credit cards and home equity accounts to fund Mr. Gliebers losses, then by all means, have at it. Mr. Glieber told me he cannot continue to lose money. Only Mr. Glieber bore the burden of financial losses over the last half of the past decade. This Executive team does not have an ownership stake in this business. If you had an ownership stake, you might have viewed the losses differently." Roger Morgan: "Does that mean we will have an ownership stake in the business if you decide to purchase it?" Fitz Gleason: "No. I will provide generous compensation for the Management Team that is assigned to this business, via bonuses that are aligned with Gleason Investment objectives." Roger Morgan: "Do you pay retention bonuses to Management Team members, in order to provide much-needed continuity? I mean, I'd hate to see the business fall off of a cliff while Management focuses on transition issues as a priority over business issues." Roger Morgan: "Why is Kevin here? What role is he going to play in this potential purchase? Is he responsible for this happening in the first place?" Fitz Gleason: "Mr. Hillstrom will use his Online Marketing Simulations methodology to determine the five year sales potential of this business. The analysis will determine the purchase price of the business, should I wish to acquire Gliebers Dresses." Glenn Glieber: "Ok team, that's a lot of information to absorb for one morning. Let's stop right here. I will be working with Mr. Gleason and Kevin over the next few weeks to help Mr. Gleason decide if he wishes to acquire our business. Thank you for your support." Digital Profiles: What Data Do You Need? For the next few weeks, we're going to talk about what I call "Digital Profiles". These are segments of customers that exhibit similar behavior. You might have 'Golden Girls', a segment of customers who are likely age 60+ purchasing via traditional channels. Or maybe you have "Robert Scobles", technology fans who eschew old-school marketing tactics. Now how the heck do you create "Digital Profiles"? I mean, you don't have the lifestyle/psychographic/demographic data you need to do this the right way, correct? Well, let's keep things as simple as possible. Let's take all purchases that happened in the past twelve months. Among these orders, you know several things. The method the customer used to pay for merchandise (Cash, Check, Visa, MasterCard, Amex, Gift Card, etc.) Hint --- cash/check are proxies for a 60+ year old customer. The day the customer purchased merchandise (Sunday - Saturday ... yes, this matters). The time of year the purchase happened (Valentines Day vs. July 4 vs. Cyber Monday ... you get the picture). The merchandise divisions the customer purchased from (think about the tabs running across the top of your website ... yes, this matters, too!). Average number of items per order. Average price per item (hint, this is important). Items 5 and 6 yield AOV. Total number of annual orders. Promotional customer (free shipping, % off). Zip Code Forensics (Urban, Suburban, Rural customer). Physical Channel the customer purchased from (Phone, Web, Store). Advertising Channel that influenced the order (Catalog, Paid Search, E-Mail, Affiliates, Social, Mobile). Did customer return more than 40% of merchandise purchased? Does customer pay for expedited shipping? This is not a finite list, use your imagination. Create a "spreadsheet", with one row per customer ... the fourteen characteristics mentioned above are columns in the spreadsheet. We'll stop here. If you can collect this kind of information, you have a fighting chance to create interesting Digital Profiles. Here's a few random thoughts for you to consider. Vendor Partners: I listened to a vendor-based e-mail marketing Vice President address an audience, and rip those who market to customers via print. This is a person who works for a company that many Catalog CEOs hire to execute e-mail marketing. Carefully scrutinize your vendor partners. Why pay companies money, only to have the company use your money to illustrate how outdated you are to an audience of prospects? Awareness: One of the 'secrets' of this new decade is the age-old concept of 'awareness'. Last decade, you had a website, you did paid search or SEO, and you generated volume. Now that online volume has flattened out, this will be the big land-grab of the new decade. You don't create awareness by renting a name and sending them a catalog, or by sending e-mail campaigns to an opt-in list, or by executing paid search. You might be able to do it via social media, though the odds are poor (hint ... individuals can do this via social media a lot easier than brands can). You're not likely to do it via mobile. Crack this nut, and it won't matter what channel you market in. Opt-Out Services: I was completely wrong about them, they didn't shut down the industry. Have you recently visited the most popular catalog opt-out service? Less than 1.2 million members, about the same number as last year. Conferences: I receive a steady stream of e-mails from Catalog Marketing leaders, asking for advice on what conferences are worth attending. Let's turn this around. What do you think you need to learn? And what kind of forum would you want to learn it in? Let's think about the kind of conference that is truly needed. Send me your thoughts, click here! Today, a private meeting with Glenn Glieber. Glenn Glieber: "You're aware that we lost $800,000 last year, Kevin." Glenn Glieber: "Explain something to me, Kevin." Glenn Glieber: "We've done everything we were told to do. We were told that we had to be 'multichannel'. Our paper rep would come in here and tell us horror stories, he'd remind us that Lands' End cut back on circulation in 1999 and it killed them, then he'd sell us more paper. Our printer came up with all sorts of fancy technologies that allowed us to do great things and add pages at minimal cost. We have an e-mail program, and we don't 'over-mail' because our e-mail vendor told us not to or we'd have customers unsubscribing at huge rates. ResponseShop does our matchbacks, and even though business is declining, they keep telling us our catalogs match to more and more and more online orders, resulting in us using their services more and more and more. Think about that one for a minute. Our list rental vendor keeps telling us to maximize revenue by selling our list to competitors --- so we do that, only to have a third party opt-out service hammer us publicly for sending catalogs to customers who don't want them, causing us to honor their requests, to be a slave to their opt-out process. We have a loyalty program that does not appear to be causing any increase in loyalty whatsoever. Our loyalty program is based on free shipping, something all of the consultants tell us we have to do to make customers happy, but when we do it, we don't seem to make any customers happy. We were told to jump into social media, and we did that with absolutely no results --- we could measure the sales from social media on our hands and toes. We optimized our site for search, only to have Google change the rules every twenty minutes. The USPS killed us in 2007 and now they demand that we continue to put catalogs in the mail, because doing so benefits their business, not ours." Kevin: "So you did what the marketing experts told you to do." Glenn Glieber: "We sure did. And here's the thing, Kevin. None of it worked. These marketing experts, they don't have any skin in the game. They make these statements to benefit their business, not to benefit my business." Kevin: "Then why do you listen to them?" Glenn Glieber: "Their arguments sound so convincing, and so easy. They tell us that if we have a free-shipping based loyalty program, then we'll make customers happy and loyal. You ever see one of those fancy case studies, the ones with beautiful fonts and fancy colors and the grand proclamations of unfettered profit?" Kevin: "Have you ever noticed that only positive case studies are published?" Glenn Glieber: "What do you mean?" Kevin: "Well, when you read a case study, you read about a success. Who is going to publish a case study outlining ten companies that failed? Who benefits from a negative case study? It's like somebody writing a case study about playing Roulette ... the person has a 'system' where betting on '27' worked for them ... the person won $12,000 by putting $400 on '27'. Never mind that every single person who bet on '27' the next thirty times lost money, this person won, and the way the person won was by putting $400 on '27'" If a person lost by betting on '27', the person will be told that he 'did it the wrong way', that he failed because he bet $350 on '27', had he bet $400, he might have done better". Glenn Glieber: "And then the entire catalog ecosystem decided to pick a series of numbers, only to have green zero come up ... and the house cleared the table." Kevin: "That's what our recession is all about, isn't it?" Glenn Glieber: "So how do I get a customer to buy from a catalog?" Kevin: "Is that the right question?" Glenn Glieber: "Look, I'm not going to do what Anna Carter did. I am not going to discontinue my catalog marketing program. We love catalogs." Kevin: "But does the customer love catalogs?" Glenn Glieber: "Where is this all going, Kevin?" Kevin: "Oh, it's going somewhere. Your business was built off of the Baby Boomer generation. And this generation is changing habits in a way that is not complimentary to your business model. They have unlimited choice, and for the first time, they don't have unlimited money. Twelve years ago, this customer was 43 years old, spending $3,000 a year across a dozen catalogers. Today, this customer is 55 years old, spending $3,000 a year across fifty catalog and online and retail brands. And remember, this $3,000 is really $2,000 after adjusting for inflation." Glenn Glieber: "And now the Baby Boomer generation has to save for retirement, with no home equity and a 401k account that is two-thirds what it was in late 2007." Kevin: "So given those facts, how can you grow your business?" Glenn Glieber: "We have to find new customers." Kevin: "Most of the new customers are likely to be younger than 45 years old, right?" Glenn Glieber: "Gen-X has the most money right now. But I don't get Gen-X. That generation isn't motivated by the same things that Baby Boomers were motivated by." Kevin: "Does it matter that you don't understand Gen-X? Shouldn't you have merchandising and marketing experts who understand that generation?" Glenn Glieber: "Couldn't we just work harder to gain market share among Baby Boomers? Couldn't I do that for a few years, fix this business, then retire?" Kevin: "How has that strategy been working for you?" Glenn Glieber: "Baby Boomer kids, I get them, heck, we've all had kids. I understand what motivates them. I don't understand the technology they use, but I understand how to speak with them. These Gen-Xers, there aren't enough of them in their generation to fuel growth, and nobody knows how to reach them. That's going to create problems, isn't it?" Kevin: "What's amazing is that your generation created what is called 'multi-channel', and then Gen-X is the generation most likely to straddle old-school channels like television and catalog and newer channels like the internet and emerging channels like mobile and social media. This is what you wanted, and when you got it, you didn't know what to do with it." Glenn Glieber: "I think we wanted Gen-X to use all of the new channels to facilitate a purchase from the channels we managed, like catalogs. And when it didn't work out that way, we suffered. I suffered. My business suffered." Kevin: "You can't wait for Gen-Y to arrive, either, they are a decade or more away from spending the kind of money that fuels a business. So if you want to grow, you're going to have to figure out how to crack that Gen-X nut, aren't you?" Glenn Glieber: "Can I tell you something, Kevin?" Glenn Glieber: "I'm going to bring in some private equity folks, have them look around, see if they might want to buy my business." Kevin: "Really? Wow. Why private equity folks?" Glenn Glieber: "You and I both know this business doesn't have much value. We've lost money for several years. Amazon isn't going to overpay for my business like they did with Zappos." Kevin: "Does your staff know about this?" Glenn Glieber: "No, and I haven't decided yet when I'm going to tell them. You know, I just don't have any answers left. We've tried everything, and nothing worked. Maybe somebody else can figure out how to make this business profitable, and I can at least retire with something to show for my efforts." Kevin: "The private equity thing can be positive, or it can be ruthless. I think they'd really test the mettle of your folks." Glenn Glieber: "Maybe it is time that my people have their mettle tested." We began our discussion of rebuilding projects with a sports analogy. Football teams have "systems" ... on offense, they follow a "west coast" or "spread" offense. On defense, football teams employ a "4-3" or a "3-4" defense. When players have skills that are complementary to the system being employed, success is possible. In Marketing, we also have "systems". Systems in Marketing are based on the existing capabilities of the Marketing team. I outlined five different Marketing Personality types ... The Organizer, The Miner, The Targeter, The Futurist, and The Strategist. Each personality type represents a "system", when compared to football "systems". The CEO hires an Organizer when the data infrastructure is in peril, or when simple customer reporting doesn't exist. The CEO hires a Miner when the company doesn't have insights into customer behavior beyond standardized reporting. The CEO hires a Targeter when the company knows how customers are behaving and needs to take action upon what has been learned. The CEO hires a Futurist when the company is good at Organizing, Mining, and Targeting, but is stuck in the past, not pushing into new micro-channels like Social Media or Mobile Marketing. The CEO hires a Strategist when the company is great at Organizing/Mining/Targeting, and is willing to take risks with a Futurist. Here's what I've learned during twenty-two years in Database Marketing. Many marketing failures can be linked to an inability of Sr. Management to link the Analytics Personality with the needs of the company. Too often, the CEO looks for a person that is above-average across all five Analytics Personality traits. There might be eleven people, world-wide, who excel at each of the five traits. Too often, the CEO assumes that an analytics individual is good at the very trait the CEO is looking to hire. The CEO wants to hire a Futurist, but only interviews Miners. This is a recipe for failure. Too often, the CEO assumes that an Organizer/Miner/Targeter infrastructure is in place, when truly, it is not in place. As a result, the CEO hires a Futurist/Strategist who does not have the tools to succeed. Remember, a Futurist/Strategist is dependent upon an Organizer/Miner/Targeter to achieve anything. Too often, Executives are bamboozled by the vendor community. Web Analytics packages focus on Organizer/Miner capabilities, but sometimes these brands sell themselves as Futurist/Strategist tools. Conversely, consultants offer Futurist/Strategist capabilities without ever providing an actionable Organizer/Miner/Targeter infrastructure. Too often, individuals over-sell themselves. The Targeter confuses her skills with those of a Strategist. For instance, I tend to be a "Futurist". Sure, I have "Strategist" tendencies, and I tend to have significant "Targeter" tendencies. But for the most part, I am a Futurist. This is why I turn down consulting projects that focus on building a database infrastructure. This is why I turn down projects that focus on building customer dashboards. Those are projects that require an Organizer. Too often, companies fail to see themselves for what they are. Catalog companies, for instance, are obsessive "Targeters". They live for linking a customer with a paper marketing vehicle. Catalog companies do not want a Futurist or a Strategist pointing them in a direction that takes them away from their core competency of targeting via paper. When a Cataloger that loves Targeting chooses to hire a Strategist, you have a mis-matched systems. Too often, a CEO fails to hire complementary skills. A CEO that wants to make all of the decisions is well-served by hiring an Organizer. A CEO that must make money RIGHT NOW is well-served by hiring a Targeter. A CEO that is obsessed with customer service needs to hire a Miner. A CEO that is being pushed to have a five year business plan needs a Futurist. A CEO that wants to evangelize customer understanding across the entire company needs a Strategist. When the CEO fails to hire for need, the opportunity for failure is increased. Ok, it is time for your thoughts. You've read essays on The Organizer, The Miner, The Targeter, The Futurist, and The Strategist. What questions do you have? Do you think this framework makes sense for your business? Can you use this framework to make more successful hiring decisions? Does the quiz help you identify candidates appropriately?